The Cheesegrater fit-out by celebrated British architects practice. 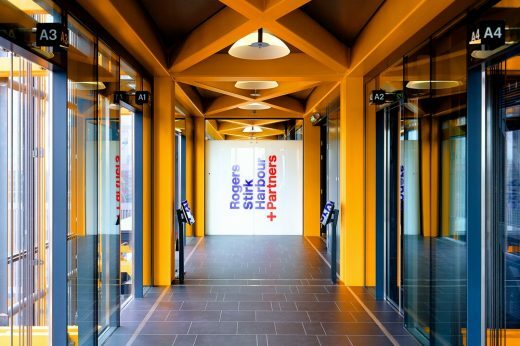 Rogers Stirk Harbour + Partners has made its mark on one of its own buildings through a fit-out which reflects and promotes its working practices and ethos. 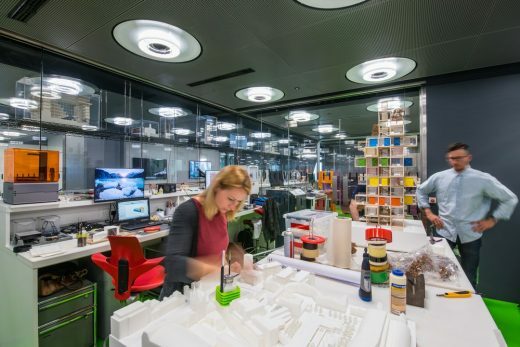 After 30 years based at Thames Wharf in Hammersmith West London, the architecture practice has moved to The Leadenhall Building, to a new studio that better suits the practice as it is now. It sought an office space that could accommodate all its 200 staff on one floor, in order to promote communication and collaborative working. Level 14 of the RSHP designed Leadenhall Building gave the opportunity to do just this. 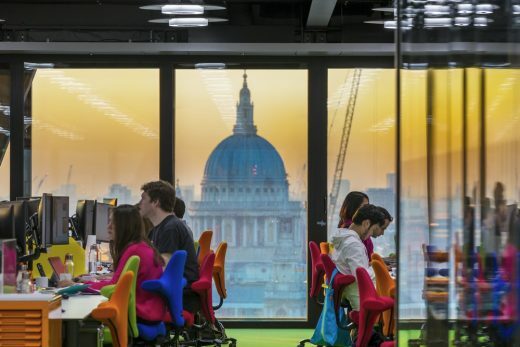 The design studios are grouped to the south, giving sight lines across the whole studio, and beyond to St Paul’s Cathedral, Canary Wharf and Lloyd’s of London. Desks are arranged in three groups aligned to each of the façades, giving the best aspect for all staff. The more highly serviced areas to the north are closer to the service core. Generous circulation space and a large kitchen give opportunities for chance encounters and informal conversations. 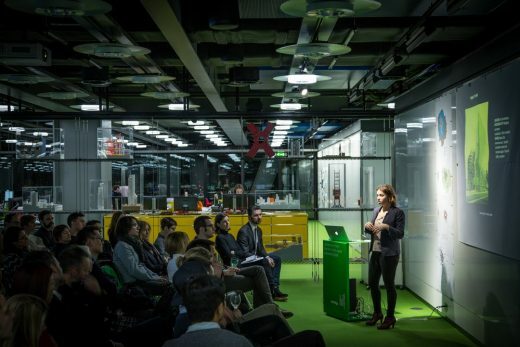 A large central meeting area, open on three sides and visible to all, provides flexible space capable of hosting either a number of small meetings; the weekly Monday Design Forum, open to all staff; or lectures and events for up to 200 people. There are no cellular offices at RSHP, reflecting the democratic philosophy of the practice. Instead, the corners are given over to quiet space, for meetings, reflection and relaxation. A planting concept by Dan Pearson Studio will be located in the corners to provide a visual amenity. 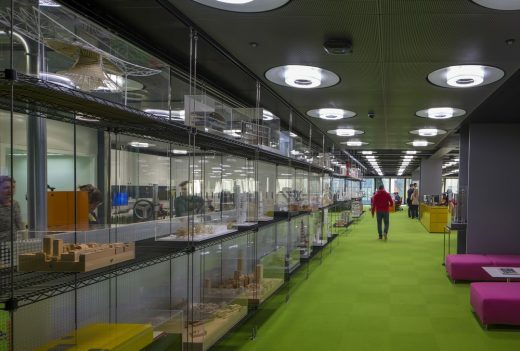 The fit-out was designed in-house, led by Richard Rogers, Graham Stirk, Ivan Harbour and Andrew Morris and was completed on time and on budget to a 16-week programme. 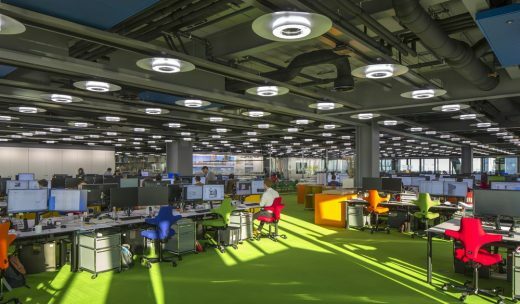 A number of products have been developed in partnership with suppliers specifically for the space, including a new benching system by Ahrend and lighting by Spectral Designs. 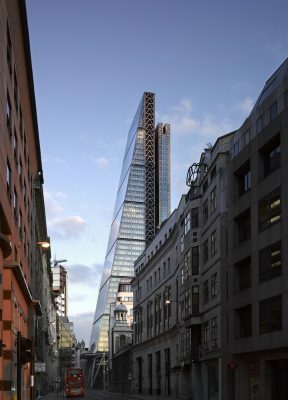 Richard Rogers, Senior Partner, Rogers Stirk Harbour + Partners said: “36 years after winning the competition for the Lloyd’s of London we are delighted to have moved across the road into The Leadenhall Building. Offices have changed immeasurably in that time, and this move from Thames Wharf Studios reflects that. 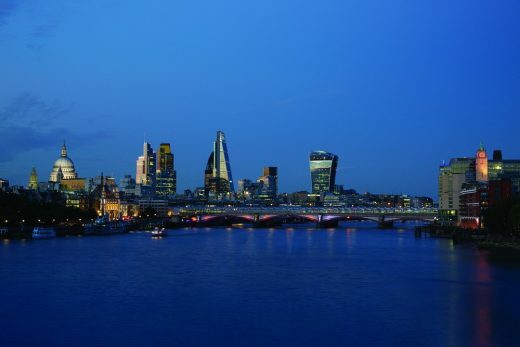 Graham Stirk, Senior Partner, Rogers Stirk Harbour + Partners said: “I never imagined we would be in the City. I always enjoyed the place, its dynamism and activity, whilst working on Lloyd’s of London and subsequent projects over three decades. During this period I have been a witness to its radical change. I am now immensely proud to be part of this transition. When the opportunity arose for us to become tenants of The Leadenhall Building, my thoughts were very much ones of how the possibilities of office space, which by its very nature tends to be neutral, could become more expressive of the buildings architectural intent. This led to our decision to reveal the muscular steelwork, services and all of the components that make a modern office space function, and celebrate them in a clear and legible manner. Ivan Harbour, Senior Partner, Rogers Stirk Harbour + Partners said: “Since the practice moved to Thames Wharf over thirty years ago we have grown in size beyond our expectation. Through those years we gradually spread ourselves across our riverside campus, over the five floors of our building and into other spaces around our courtyard. The riverside location was unique but on a daily basis it was hard to get together as a single studio. Our collaborative spirit was ultimately challenged by our workplace. When our freeholder indicated they were not going to renew our lease we decided we should look for a place where we could all be in one studio, together. As a practice of around 200 people our options were severely limited and it seemed an impossible dream that we might find the right sized space in a building of our own without moving even further out of the city we love or moving to an established enclave in a building designed by others. 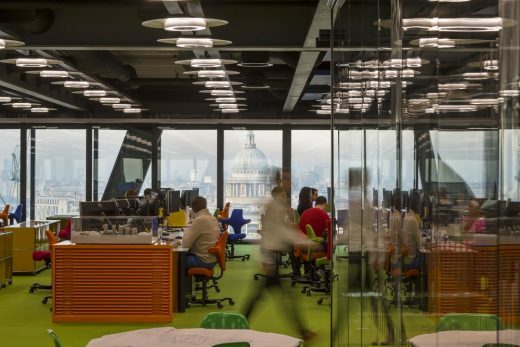 Maurice Brennan, Project Architect, Associate, Rogers Stirk Harbour + Partners said: “When we started the design of RSHP’s Level 14 fit-out we already knew the building inside-out. We had written the original Leadenhall Building occupier fit-out guide for British Land / Oxford Properties but we were now being encouraged by our client turned landlord to tear it up and come at it afresh. The design for Level 14 naturally became an extension of the principle architectural organisation of the building and a legible expression of its constituent parts informed by the division of spaces into ‘served space’ and ‘servant areas’. The servant areas to the North are made up of glazed support accommodation that becomes a natural extension to the building’s primary North support core with loose fit perforated ceilings and expressed structure. In the main studio, defined by the building’s primary megaframe structure to create a single, uninterrupted light-filled 1,100 sq m studio space, we dispensed with ceilings and gained an extra metre in height to give a floor to soffit height of 3.7m providing an open, legible M+E installation. Andy Sedgwick, Director, Arup said: “The RSHP fit-out on level 14 exposes the engineering skeleton of The Leadenhall Building to view: high level services reticulate through the steel floor beams, taking support from the precast concrete floor panels above. 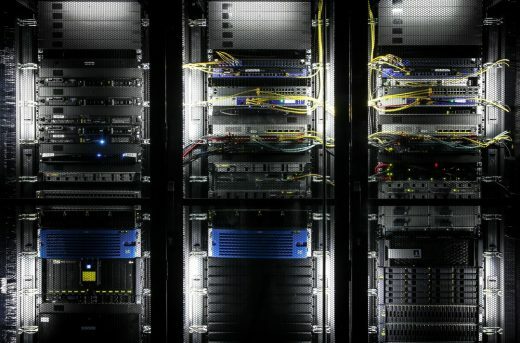 The contractor was provided with a fully coordinated Revit model allowing an orderly installation at great speed. Air conditioning is provided by high-level packaged fan coil units that contain all valves and controls in a common housing with the coils and the fan. Integral sound absorbing panels give the underside of each unit a tidy appearance, and ductwork and pipework is clad with black nitrile rubber that provides additional sound absorption as well as thermal insulation. 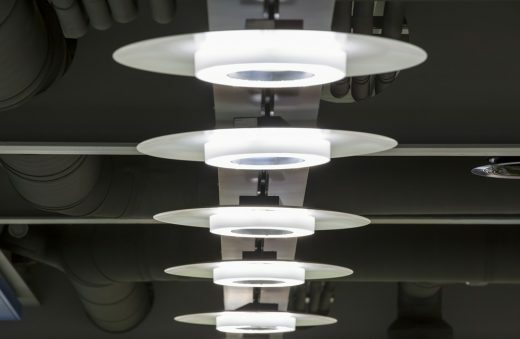 The floor-by-floor approach adopted to air handling at Leadenhall means that each tenant can run their climate control system for extended hours independent of the other floors. Heat recovery between the supply and exhaust unit is by run-around coil – this means there is no recirculation of exhaust air, and local extract systems for the modelshop and kitchenette areas can simply be joined with the general office extract for exhaust.